Killarney Celtic advance to the last eight of the Munster Junior Cup with a win over Clare side Shannon Town on Saturday night. Conor Randall scored the only goal of the game midway through the first period of extra time. Killarney Celtic will now face Limerick side Janesboro in the last eight. Premier A side St Brendans Park proved to strong for Division 2B side Sporting Listowel on Sunday to book their place in the last eight of the Greyhound Bar KO Cup. Fergal Maunsell, Mark O’Sullivan , David Courtney, James O’Sullivan, Brendan Coffey, Michael Conway and Graham O’Leary all scored for St Brendans Park with Reiss Barran scoring for Sporting Listowel . Tralee Celtic and Ballymac Galaxy must meet again to see who will advance to the last eight of the Greyhound Bar KO Cup . Jordan Murphy and Fergal Moynihan scored for Tralee Celtic with Padraig McCarthy and Aidan Breen scoring for Ballymac Celtic. 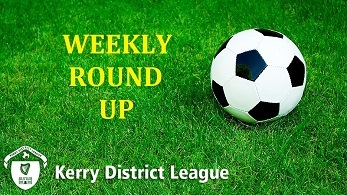 Behy Rovers made their return to playing in the Kerry District League on Wednesday night and nearly pulled of a cup shock when they ran Premier B side Killorglin Fc very close. Lee Carey , Daniel Whittleton and Paul McCarthy all scored for Killorglin Fc with Johnny Carey and Karl Falvey scoring for Behy Rovers . Denny Division 2B sides Abhann Li and Windmill United will have to meet again to see who will advance to the third round of the Dominos Pizza Reserve Cup. Mastergeeha B team secured their place in the third round with a win over Ballymac Celtic on Sunday evening where Eoin Edwards scored twice for Ballymac Celtic. Na Fianna are into the last 16 with their win over Strand Road on Sunday afternoon. David Dillon, Kevin Murphy and Jason Enright all scored for Na Fianna Fc with John Griffin scoring for Strand Road Fc. Camp United moved fro the bottom of the table up to eight with a narrow win over Mastergeeha on Friday night. James Crean scored twice for Camp United in what could be a very valuable three points in the bid to avoid relegation. Ballymac Galaxy moved up to joint fifth win a win away against Rattoo Rovers in Mounthawk Park on Monday night. Pa McCarthy and Cian O’Brien were the Ballymac Galaxy scorers. Classic Fc extend their lead at the top of the division with a win at home against Skeliga Fc with Shane Fitzgerald and Brendan Sweeney both scoring twice for Classic Fc. St Brendans Park B are up to fifth win a win against Castlemaine United on Sunday morning. Darren O’Brien scored a hat trick with Donagh O’Brien and Darcy O’Sullivan getting one each . CG Killarney are back on top of the division with a hard earned draw away against Listowel Celtic B on Sunday afternoon. Eoin O’Mahony was the CG Killarney goal scorer. Sneem Santos are up to fifth place with the aid of a walkover from Classic Fc B .
CS Abbeydorney and Tralee Bay Fc couldn’t get the better of each other on Sunday morning as both picked up a point each. Marcos Prendiville scored for CS Abbeydorney with Darren Young scoring for Tralee Bay Fc . Inter Kenmare are up to seventh place with the help of a walkover from Lixnaw Fc on Sunday. St Brendans Park remain in second place with a win over Ballylongford fc on Thursday afternoon in Mounthawk Park. Donagh O’Brien and John O’Brien bot scored a hat trick each for St Brendans Park Fc. Fenit Samphires are back on to of their section with a win over Tralee Dynamos on Tuesday afternoon in Mounthawk Park. St Brendans Park booked their place in the Dominos Pizza Cup quarter final with a win over Listowel Celtic A team on Wednesday in Mounthawk Park. Adam Ward scored twice for St Brendans Park with Cian Killeen and Rory Kelly getting one each. AC Athletic are also into the last eight with a win away against Listowel Celtic B on Friday afternoon. Cormac Slattery scored twice with Barry Mahony getting one for AC Athletic. Castlemaine are into the quarter final stage with the aid of a walkover from Inter Kenmare on Saturday.